Our newest products are from our most recommended brand for incontinence, Prevail! They just released gender specific underwear and Breezers 360°, a more breathable version of their most popular brief, Breezers. These are great products, but I was really impressed by Per-Fit- 360° Briefs. They have velcro-like tabs that stretch, contributing to the brief's comfortable fit and allowing you to refasten it if you don't get it perfect the first time. The breathability of the material is great for skin health and comfort. These briefs are more absorbent than previous versions of this brief due to an absorbent core in the center. 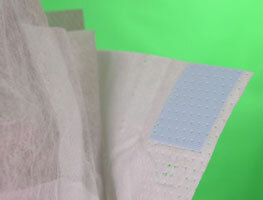 These are great for light to medium urinary incontinence or for bowel incontinence. However, I would not recommend these briefs for someone that has heavy urinary incontinence; a more absorbent brief (heavy or overnight) would perform better in that situation. What sets these briefs apart from the rest, though, is their affordability. They are an all around great product that are less than $1 apiece. You can get Per-Fit 360° Briefs delivered to your home for free by ordering on Home Delivered.